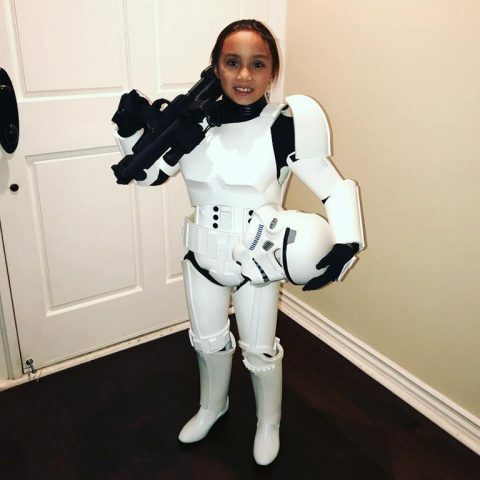 This 8-Year-Old Isn’t Too Short to Be a Stormtrooper « Adafruit Industries – Makers, hackers, artists, designers and engineers! I hand cut all of it out of 1/4” EVA foam using paper templates I found online. It is then assembled using contact cement, I shaped the pieces with a heat gun. Used techniques I learned watching Evil Ted on YouTube. Evil Ted Smith’s YouTube channel is an exceptionally helpful resource if you’re into making. He has dozens of videos covering everything from making foam helmets, to using a 3D printer to make Baby Groot, to modifying Nerf blasters into cool props.